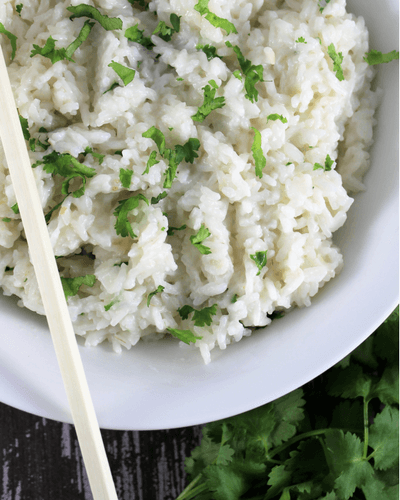 Coconut Rice is a creamy simple side dish with fresh cilantro mixed in. Great way to amp up your regular rice with some extra flavor and color. If you saw our Thai Inspired Buddha Bowls a few weeks back, you remember we did a coconut brown rice. The rice was so delicious that I wanted to try it with a white rice so we did and loved it. The big plus of using a white rice is the cook time. Brown rice takes a good hour and coconut rice takes 30 minutes so fantastic for busy nights. 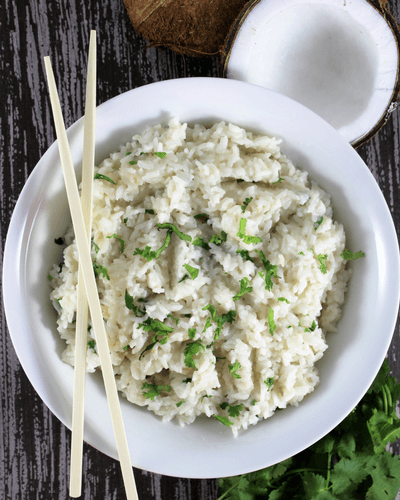 Try Coconut Rice with the Garlic Ginger Chicken from our sister website at Leggings ‘N’ Lattes. It really is the perfect match! 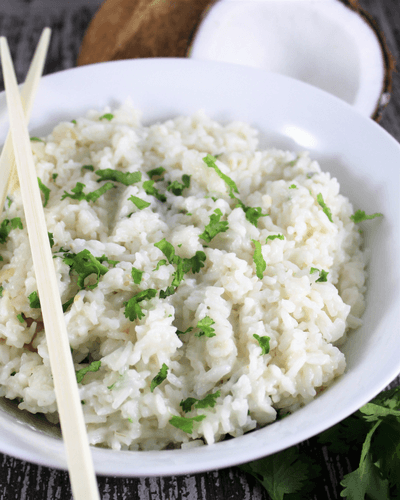 If you have never tried coconut rice, you are probably wondering what it tastes like. Coconut milk adds a really creamy texture to the rice and the flavor is a little different but not drastically to that of a regular rice. It will pair well with any dish you normally make with rice. We did add tablespoons worth of freshly chopped cilantro to add some color and flavor. I realize some people are not fans of cilantro so if you are one of those, you can easily leave out the cilantro or even try adding in an herb you enjoy. We always use a rice cooker for any sort of rice. If you cook rice at least once a week like we do, I recommend buying one too. It is so nice to just dump everything in the rice cooker, push on and have it switch off by itself when the water is absorbed. Plus, the rice doesn’t stick like it can in a pot. I’m not here to sell you on anything though. Its just a kitchen gadget that we use often is affordable. 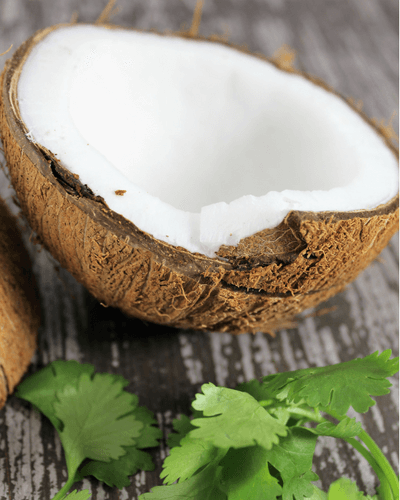 Hope you enjoy the Coconut Rice recipe! Gather ingredients, pot, measuring cups, knife, cutting board and can opener for coconut milk. In the pot, add rice, coconut milk, salt, water, and honey. Bring to a simmer. Cover and let cook according to rice package time or until all liquid is absorbed. Finely chop the cilantro. You will need about 3 tablespoons worth. 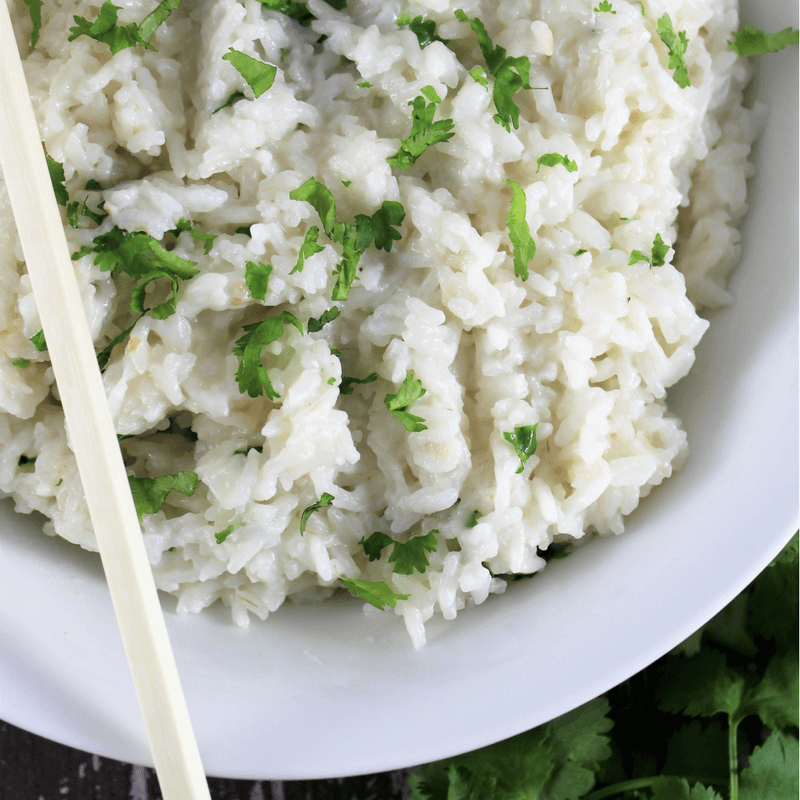 Remove rice from heat when finished cooking and mix in the cilantro. 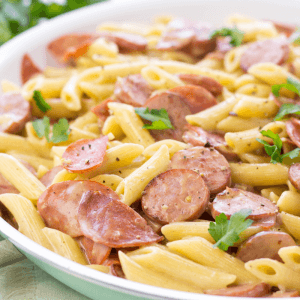 Simply Made Recipes is a participant in the Amazon Affiliate Program, an affiliate advertising program designed to provide a means for sites to earn advertising fees. If you click on an affiliate link and make a purchase, we may receive a small commission. This costs nothing extra to you and helps keep Simply Made Recipes running!